Vaccines and autism: A new study shows no connection. 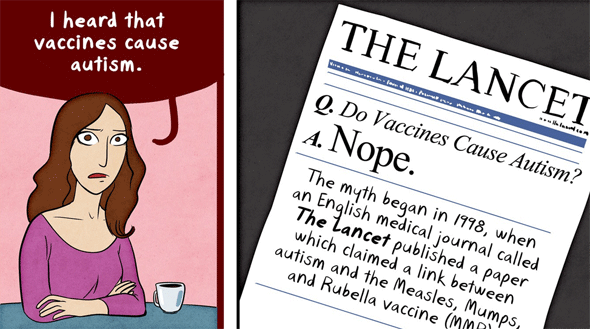 A panel from my pal Maki Naro’s great comic strip about vaccines and autism. Click to read it; it gives a good background on all this. Let’s start this off by being very clear: Vaccines don’t cause autism. They just don’t. Perhaps I should be scientific, careful, technical, and say that no connection between vaccines and autism has ever been found. That’s technically true, because, after all, there is some incredibly small chance that eventually perhaps some connection might possibly be found. But when study after study after study shows no such connection whatsoever, at some point it’s probably OK to close the door on this. Now it’s time to slam it shut. A new study, reported in the prestigious Journal of the American Medical Association, looked at a group of more than 95,000 children and found no connection between the Measles-Mumps-Rubella vaccine and incidence of autism. Emphasis mine, but c’mon. That’s emphatic. These findings indicate no harmful association between MMR vaccine receipt and ASD even among children already at higher risk for ASD. In other words, the MMR vaccine is not associated with autism. This new study is getting some press, which is nice, but I’m seeing here and there some folks hoping this will be the last nail in the anti-vax movement. It won’t be. That’s because the anti-vaxxers are not basing their decisions on science, they’re basing them on emotion. We’ve seen this over and again; as I pointed out before, this isn’t the first study showing no link between vaccines and autism. People simply don’t make decisions based on facts. That’s not how we’re wired. Fear is an incredibly strong motivator, and many of the anti-vax groups use it to their advantage. Look at the truly atrocious Australian Vaccination Skeptic Network, who actually and truly compare vaccination to sexual assault (and seriously, survivors of such assaults may want to have a care clicking that link; the AVSN graphic is abhorrent and brutal). And look no further than someone like Robert F. Kennedy Jr., who believes that vaccines cause autism, and compared this to the Holocaust. Yes, the Holocaust. He backed off that analogy when called out on it, yet few seem to remember this isn’t the first time he’s made this despicable claim. I’ve written about Kennedy before, taking him to task on his unfounded claims, and wrote a follow-up after he doubled down on it. So yeah. The folks who beat the drums about vaccines and autism will never stop. My hope is that they will eventually be marginalized, like Moon Hoax believers. The good news is that action is being taken. California is looking at stricter rules for parents who want to opt out of vaccinating their children, for example, and in Australia, the religious exemption is being removed. And of course the forces of good are still at work, promoting vaccination. The Bill and Melinda Gates Foundation has put out a lovely campaign using art to show how important vaccines are. Called The Art of Saving a Life, it features works of film, literature, music, photography, and more. As someone who loves classical music, especially Debussy, one video in particular struck me. Called Afternoon of a Faun, it’s a powerful piece about Tanaquil LeClercq, principal dancer at the New York City ballet. Before a European tour in 1956, she declined getting a polio vaccine. She contracted polio in Copenhagen and became paralyzed. She never danced again. Chinese pianist Lang Lang performs the pas de deux from Debussy’s Afternoon of a Faun, with images of LeClercq in the background. I would like to personally thank Mr. and Mrs. Gates for supporting this project. It is extraordinarily difficult to discuss this topic with people who lean toward being against vaccinations, and it’s all too easy to reinforce their beliefs. I think that by continually putting forth a positive message, together with presenting the facts, we can get vaccination rates in this country up to where they need to be to protect us all. As a father myself, and with an immunocompromised family member, I know how important this is. When you get vaccinated, the life you save may be your own, and it may also be someone you know and love. But it may very well be someone you don’t know, but who is loved by others. To those of you who vaccinate: I thank you too.